A boat we are buying was parked under a tree, now all newly covered vinyl cushions have brown spots on them, new white / dark purple vinyl cushions. I do not want to purchase it if the stains will not come out. 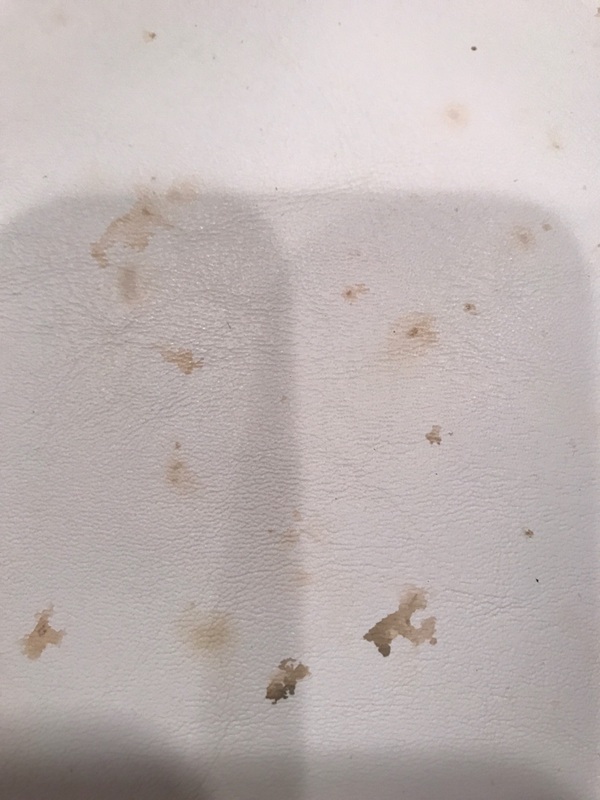 I brought 1 cushion home to see if I can clean it with little positive results in making the stain lighter,but is still visible. I tried the following products in an inconspicuous spot on the bottom of cushion: Peroxide, rubbing alcohol, toilet bowl cleaner, comet, soft scrub, majic eraser, Dawn.I am sending you pic’s as well. I hope you can help me as we really want to buy the boat. Thank you for the pictures. They help me to understand your problem. It appears that the stains are tannin. If they are recent they should still be superficial in which case a 50/50 solution of Boat Clean Plus and Boat Scrub should get them out. If they have been on the seats for some time and have penetrated, then they will be indelible and can’t be removed without damaging the vinyl. Bleach will damage the vinyl and will discolor the darker colors, so I would not advise that. Many have had good success with the 50/50 solution described above and it’s recommended by boat manufacturers as a last resort in tough stain removal. It may be worth a try if the boat is that important to you, but no guarantees.